Central Bank of Russia cut policy rate to 11.5% today from 12.5%, undershooting markets expectation for a 150bps cut to 11.0%. The move was expected and relatively modest cut this time around suggests more heavy cuts in 2H 2015. In part, this reflects relatively sharp decline in growth in April: having contracted modest 1.9% in 1Q 2015, Russian GDP fell at an annual rate of 4.2% in April. Another incentive for CBR to lower rates is the Ruble, which posted surprising comeback in early 2015, putting new pressure on the federal budget. CBR bough USD3.6 billion in May, in an attempt to keep Ruble lower. Rate cut is a welcome move, but in current environment it also shows just how little room for manoeuvre the monetary policy has. Russian banks are deleveraging. Loans outstanding in the corporate and household sectors have fallen in 1Q 2015. The trend continued in April: SME loans share of total corporate loans fell from 22% in April 2014 to 18% in April 2015. In January-April 2015, corporate lending outstanding was up nominally 17% in ruble terms compared to the same period 2014. Inflation run at around 15.8%, which means that in real terms, corporate loans remained basically flat. Household loans grew by 4% y/y in ruble terms. Which means in real term, level of outstanding loans to households fell. As usual, roughly 1/3 of all corporate loans were denominated in foreign currency. The rate cut will also help with non-performing loans. Stock of NPLs in the corporate sector rose by roughly 30% y/y in the first four months of 2015 to 6% of the total stock of corporate loans. Household credit NPLs stood at 7%. Both rates of NPLs are relatively benign, by Western standards, but the growth rate in NPLs is worrying. Lower cost of carrying these loans will help alleviate some of the pressures. Overall, Russian investment remains a major bottleneck for the economy. 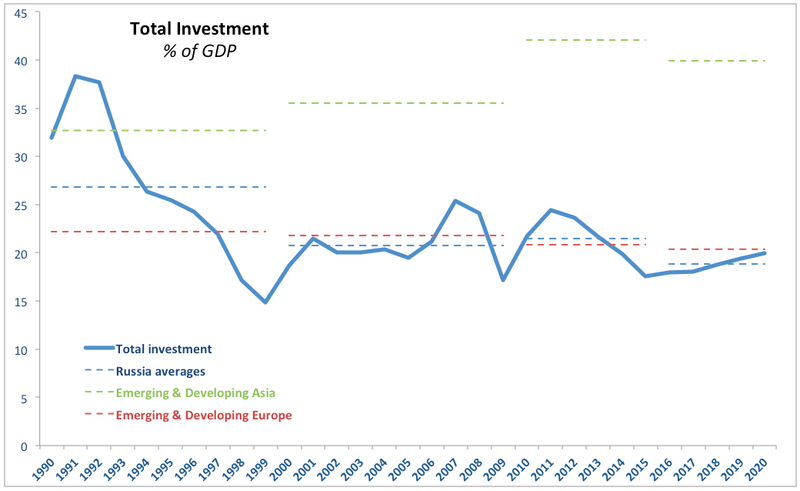 Chart below shows Russian Investment as percentage of GDP, compared to both the Emerging Asia economies and Emerging Europe economies. 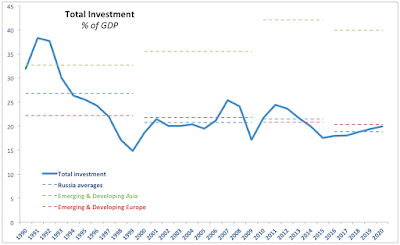 This clearly highlights the dire state of Russian investment over 2000-2013, and a significant decline in investment from 2014 on, including the IMF forecasts for 2015-2020 period.